If you’ve been struggling to hear, you’re not alone. Nearly 40 million Americans have hearing loss, and many are asking the same questions about their hearing loss as you are. 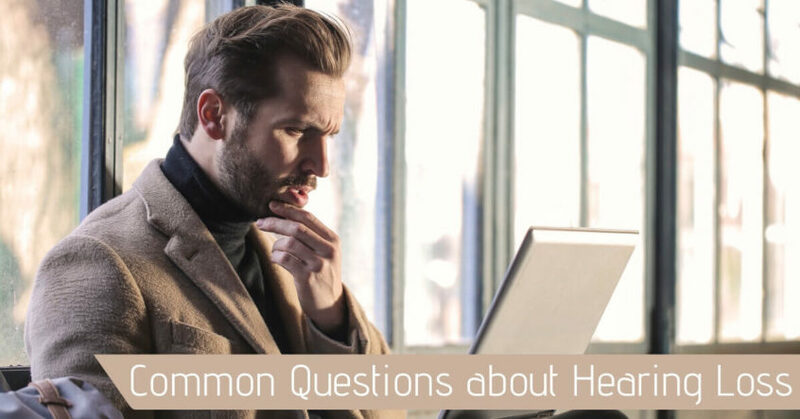 If you’ve been wondering what causes hearing loss, or what kinds of hearing aids will match your lifestyle, come to Hearing Aid Associates where we have all the answers. Hearing loss can be caused by a number of factors. One of the most common types of hearing loss is presbycusis, or age-related hearing loss. This hearing loss is associated with the normal wear and tear that your ears experience throughout life. As you age, the delicate cells in your inner ear start to deteriorate, and when these cells are damaged or die, you’ll experience hearing loss. Another cause of hearing loss is noise exposure, and many people suffer from noise-induced hearing loss (NIHL). When sounds are extremely loud, they can permanently damage the cells in your ear, causing hearing loss. This can happen suddenly, from one extremely loud sound at close range. More often than not, NIHL is a gradual process, and at first you might not notice the subtle changes to your hearing health. Noise-induced hearing loss is completely preventable, and if you’re worried about your hearing, you should be protecting your ears. Any time you’re exposed to loud noises, pop in a pair of foam earplugs, and protect your hearing. Noises that can damage hearing include heavy machinery, motorcycles, sirens, firearms, power tools, sports events, and loud music. How Will Hearing Loss Affect My Health? Hearing loss affects far more than your ability to follow conversations or participate in dinner-time banter. Struggling to hear will take its toll on your overall health and wellbeing, and many studies have shown that living with untreated hearing loss increases your risk of social isolation, loneliness, and depression. Hearing loss has also been linked to rapid cognitive decline. As you start to pull away from family and friends, have a hard time understanding conversations, and feel more isolated, your brain undergoes a lot a changes, and parts of the brain you’re not using to hear may begin to deteriorate. This cognitive decline increases your risk of dementia or Alzheimer’s Disease. Many people avoid treating their hearing loss because they’re afraid that wearing hearing aids will make them seem old. If you’ve been imagining a clunky pair of hearing aids that whistle, or don’t amplify sounds correctly, think again. Modern hearing devices are sleek and sophisticated, and function like tiny computers, chockful of amazing programs and features designed to help you hear in any listening environment. Behind the ear devices are small and slender, and sit snuggly on the back part of your ear, completely hidden by your hair. For an even more discreet device, we have hearing aids that sit within the ear canal and are nearly invisible. These hearing aids won’t make you look old, and the only think people will be noticing is how well you’re able to hear. Hearing aids are amazing pieces of technology and will give you back the ability to follow conversations with ease and participate in all aspects of your life. However, once your hearing has been lost, it can never be restored. Hearing aids will give you back sounds you haven’t heard in years, but they can’t replace the clarity or complexity of your ears. The best thing you can do is treat your hearing loss as soon as possible to protect the hearing you still have. Not only will wearing hearing aids help you hear clearly, they’ll also keep your brain active, and help you hang onto the hearing that you have. If you have any more questions about your hearing, visit us today at Hearing Aid Associates. Our team of hearing specialists will be able to address all your concerns, and help you make the best decision for your hearing health. You’ll be sure to find the perfect hearing aid among our wide selection of hearing devices from the world’s top manufactures, and you can get back to doing the things you love.